I'm just not sure where to go from here. According to lshw's output, my wifi device is a Broadcom-something chip. 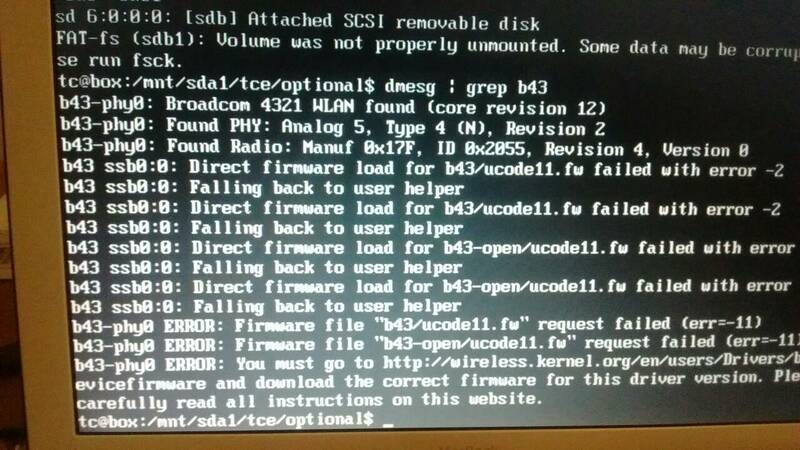 The problem being that apparently I need firmware in order for it to do literally anything. I've searched (as best I can) the forums depicting ways to get this poor thing to work, and come up pretty dry. From finding posts that claim to be able to get it working in 5 minutes, to using b43-fwcutter (which failed complaining about an md5 mismatch), to literally installing everything that said "firmware" and "wifi" (or wpa). Any hints? This has really got me stumped. I'd look here http://forum.tinycorelinux.net/index.php/topic,12910.msg73355.html#msg73355 in fact the whole thread has useful info regarding Broadcom devices. I've had a bunch of broadcom wireless hardware over the years and (in the end) I've always managed to get it to work one way or the other. The first step would be to use "lsusb" from usb-utils or "lspci" from pci-utils to let us know exactly what broadcom hardware you have. Once we know what hardware you have, then we can look whether b43 + firmware, wireless-compat + firmware, wl or ndiswrapper is required to get things working. I know this is a huge bump, but I figured this would be better than reposting basically the same topic. I am trying to install a wpc54g pci card, which uses the b43 driver(which is installed) and i also have the matching firmware installed to /usr/local/lib/firmware. From there, I don't know where the problem is. Wicd's daemon wont start, and wicd itself seems to scan for a split second before saying it cannot find anything. Wifi.tcz detects wlan0, but shows no networks(there are several here.) wpa_supplicant cannot start wlan0, ifconfig will stop wlan0 but fails on start. lspci shows the correct card is loaded, modprob shows modules are loaded, wpa_gui is missing SYNC extension for Xlib, etc. I am at a loss. Help? Maybe we can continue with my same wifi problem. I'm beginner. Spent so much time to get wifi working. tinycore is already installed on my harddrive . Now I booted Core Plus with wireless+firmware extensions. Please use code blocks instead of screenshots, copy file contents into this forum's code blocks. Reboot, run wifi to find local wireless connections. If your connection is hidden then look at wpa_supplicant. From the screenshot output, either the firmware extension is being loaded after the wireless-KERNEL extension (it should be loaded first) or the wrong firmware extension is being loaded. So in this case, firmware extension is "firmware-broadcom_bcm43xx.tcz", and wireless-KERNEL extension is wireless-4.2.9-tinycore.tcz, right? I checked tce/optional by booting from a DVD, and i saw firmware extension is loading before wireless-KERNEL extension. I guess its the right way. Does it mean i need to download a new b43 extension? ..that you have the correct/latest driver/firmware for your device - note that from this link it looks like you need to use the wl-modules-KERNEL driver rather than b43 from wireless-KERNEL, but I might be mistaken. Note that if you use wl-modules-KERNEL, the firmware is contained in the driver so you don't need any firmware extensions and you will have to blacklist b43 and friends (see the info file). I found "wl-modules-4.2.9-tinycore64.tcz", "wl-modules-4.2.9-tinycore.tcz" as a list on internet. But is there a link that I can download from internet? Because I don't have connection. But I'm transfering packages from another pc(which i have connection) with usb. Presumably you already have the wifi extension and it's deps?